The 2008 American League Central tie-breaker game was a one-game extension to Major League Baseball's (MLB) 2008 regular season, played between the Chicago White Sox and Minnesota Twins to determine the champion of the American League's (AL) Central Division. It was played at US Cellular Field in Chicago, Illinois, on September 30, 2008. The White Sox won the game, 1–0, on a home run by Jim Thome, the lowest-scoring game in MLB tie-breaker history. 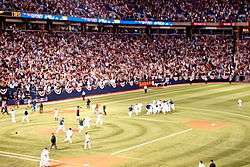 The Sox advanced to the 2008 AL Division Series, where they lost to the Tampa Bay Rays, three games to one; the Twins failed to qualify for the postseason. The game was necessary after both teams finished the season with identical win–loss records of 88–74. The White Sox won a coin flip late in the season which, by rule, awarded them home field in the game. The tie-breaker counted as the 163rd regular season game by both teams, with all events in the game added to regular season statistics. The game was played at US Cellular Field in Chicago. Fans were encouraged to wear black clothing in support of the home team. Prior to the start of the season, the Detroit Tigers and Cleveland Indians, the division's top two finishers in the previous season, were predicted to be the strongest teams by journalists such as Tom Verducci of ESPN and Joe Sheehan of Baseball Prospectus. However, the Indians lineup was weakened by injuries and spent just 13 days of the season in the division lead, last on May 17. The Tigers never led the AL Central and finished the season in last place, 14 games back. The White Sox led for most of the season starting with a tie for first on May 17, held at least a share of the lead for 154 days, and never dropped more than a game behind the leader. The Twins spent much of the season in second place behind the White Sox, along with 54 days in the lead. Despite going 11–15 in September, the Twins took a half-game lead with an extra innings win over the White Sox on September 25 that capped a three-game sweep of Chicago. The Twins maintained that lead through their final game, forcing Chicago to play a make-up on September 29 against the Tigers which had been rained out earlier that month. The White Sox won, 8–2, leaving the Sox and Twins tied atop the AL Central with 88–74 records, forcing a tie-breaker to decide the division. Tickets for the tie-breaker sold out within an hour of the end of the September 29 game. The White Sox won the right to play at U.S. Cellular Field, their home field, as a result of a coin flip earlier in September. Fans were encouraged to wear all-black clothing to show support for the White Sox. The game was broadcast on TBS. The White Sox used John Danks on three days rest as their starter, and the Twins started Nick Blackburn. Jim Thome, seen here in the regular season, was responsible for the only run of the game with a solo home run in the 7th inning. Both Blackburn and Danks held the game scoreless early on, allowing only six baserunners through the first four innings of the game. The Twins' Michael Cuddyer led off the top of the fifth with a double, the only Twins runner in scoring position for the entire game. Danks induced a deep flyball out from Delmon Young, which allowed Cuddyer to advance to third. Brendan Harris hit a deep flyball to center field which was caught for an out by Ken Griffey, Jr. Cuddyer tried to score on the ball as a sacrifice fly, but Griffey delivered an accurate throw to home plate and White Sox catcher A. J. Pierzynski blocked the plate and tagged out Cuddyer to end the inning. This play drew praise after the game as a "nice throw" and a "defensive gem". 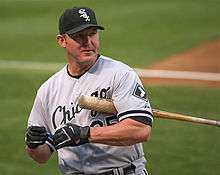 The only run of the game scored when White Sox designated hitter Jim Thome led off the bottom of the seventh inning with a solo home run. Blackburn got Paul Konerko to ground out, but allowed a double to Griffey and, following an intentional walk to Alexei Ramírez, José Mijares relieved him. John Danks lasted through eight innings without allowing a run and was relieved by closer Bobby Jenks in the ninth. Jenks recorded three outs, securing the White Sox' 1–0 victory with his 30th save of the season. Twins batters Joe Mauer, Justin Morneau, and Cuddyer had a combined 22 hits in 40 at-bats (.550 batting average) against Danks for their careers but in the tie-breaker they combined to go 1–for-9 (.111) with 3 strikeouts. This game saw the lowest combined score of any tie-breaker game in MLB history, three runs lower than the 3–1 score of the first game of the 1951 National League tie-breaker series. With the victory, the White Sox earned their first playoff berth since their win in the 2005 World Series. However, they lost to the eventual pennant-winning Tampa Bay Rays, three games to one. Statistically, the game counted as the 163rd regular season game. Thome's home run, for example, was his 34th of the season. This total brought him a tie for fourth most in the league. Danks lowered his earned run average from 3.47 to 3.32 in the game, which moved him from a tie for tenth-best in the league with Zack Greinke to fifth place. Mauer, Morneau, and White Sox outfielder Carlos Quentin won Silver Slugger Awards for their offensive performances in the 2008 regular season. Mauer also won a Rawlings Gold Glove Award that year. This was the last tie-breaker with home field determined by a coin flip. Following the 2008 season MLB amended their rules, leaving future tie-breaker sites to be determined on a series of performance-based criteria beginning with the head-to-head record between the teams. "September 30, 2008 Minnesota Twins at Chicago White Sox Box Score and Play by Play". Baseball-Reference. Sports Reference LLC. Retrieved May 2, 2010. ↑ "2007 American League Season Summary". Baseball-Reference. Sports Reference LLC. Retrieved May 2, 2010. ↑ Verducci, Tom (March 25, 2008). "Season forecast: My playoff picks and surprise teams for '08 campaign". SI.CNN.com. Sports Illustrated. Retrieved May 2, 2010. ↑ Sheehan, Joe (March 30, 2008). "Prospectus Today: AL Preview". Baseball Prospectus. Prospectus Entertainment Ventures, LLC. Retrieved May 2, 2010. ↑ Mass, AJ (February 26, 2009). "30 Questions: Can Pronk, V-Mart bounce back?". ESPN.com. ESPN Internet Ventures. Retrieved May 2, 2010. ↑ "2008 Cleveland Indians Schedule, Box Scores, and Splits". Baseball-Reference. Sports Reference LLC. Retrieved May 2, 2010. ↑ "2008 Detroit Tigers Schedule, Box Scores, and Splits". Baseball-Reference. Sports Reference LLC. Retrieved May 2, 2010. 1 2 "2008 Chicago White Sox Schedule, Box Scores, and Splits". Baseball-Reference. Sports Reference LLC. Retrieved May 2, 2010. 1 2 3 "2008 Minnesota Twins Schedule, Box Scores, and Splits". Baseball-Reference. Sports Reference LLC. Retrieved May 2, 2010. ↑ "Casilla's 10th-inning single gives Twins sweep of ChiSox". ESPN.com. Associated Press. September 25, 2008. Retrieved May 2, 2010. 1 2 "Ramirez's grand slam paves way as White Sox force tiebreaker with Twins". ESPN.com. Associated Press. September 29, 2008. Retrieved May 2, 2010. 1 2 "White Sox tiebreaker game sold out". MLB.com. September 29, 2008. Retrieved May 3, 2010. 1 2 3 "White Sox claim home-field advantage if AL Central comes to tiebreaker". ESPN.com. Associated Press. September 30, 2007. Retrieved April 12, 2010. ↑ Branch, John (October 4, 2008). "When Spotlight Is On, the Clothes Turn Black". The New York Times. Retrieved May 3, 2010. 1 2 3 4 5 6 7 "September 30, 2008 Minnesota Twins at Chicago White Sox Box Score and Play by Play". Baseball-Reference. Sports Reference LLC. Retrieved May 2, 2010. 1 2 Just, David (October 1, 2008). "White Sox marvel at Griffey's throw". MLB.com. Major League Baseball. Retrieved May 2, 2010. ↑ "Danks limits Twins, Thome blasts solo shot as ChiSox clinch playoff berth". ESPN.com. Associated Press. September 30, 2008. Retrieved May 2, 2010. ↑ Just, David (September 30, 2008). "Danks steps up in tiebreaker". MLB.com. Retrieved May 3, 2010. ↑ "Tiebreaker Playoff Results". ESPN.com. Associated Press. September 30, 2008. Retrieved May 3, 2010. ↑ "Chicago White Sox Team History & Encyclopedia". Baseball-Reference. Sports Reference LLC. Retrieved May 3, 2010. ↑ "2008 League Division Series – Tampa Bay Rays over Chicago White Sox (3–1)". Baseball-Reference. Sports Reference LLC. Archived from the original on 5 April 2010. Retrieved May 3, 2010. ↑ Newman, Mark (September 29, 2008). "Baseball a salvation in tough times". MLB.com. Retrieved May 3, 2010. ↑ "2008 American League Batting Leaders". Baseball-Reference. Sports Reference LLC. Retrieved May 3, 2010. ↑ "2008 American League Pitching Leaders". Baseball-Reference. Sports Reference LLC. Retrieved May 3, 2010. ↑ "John Danks 2008 Pitching Gamelogs". Baseball-Reference. Sports Reference LLC. Retrieved May 3, 2010. 1 2 "2008 American League Awards, All-Stars, & More Leaders". Baseball-Reference. Sports Reference LLC. Retrieved May 3, 2010. ↑ "Ownership approves two major rules amendments". MLB.com. Major League Baseball. January 15, 2009. Retrieved August 25, 2011.